About us - Tenerife Property Shop S.L. We would like to take this opportunity to welcome you to our website and introduce ourselves, and our company. Tenerife Property Shop is a family business and we have been assisting people to purchase property in Tenerife for 30 years now. Having overcome the language barrier and endured the complications of purchasing a property on this paradise island, we knew that we could make the whole process easier and safer for foreigners like ourselves. Almost a third of a century later, with another generation of our family working in the company, we can confidently say that we have achieved our objective! … Tenerife Property Shop is covered by Professional Indemnity Insurance, which provides our purchasers with safety and security during their purchase, protecting deposits paid, misrepresentation, negligence and much more. 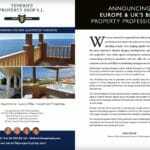 … Tenerife Property Shop provides a Safe Purchase Guarantee: This is a unique product that is not for sale to the general public but is exclusively for clients who purchase a property through us, to give them safety and security following their purchase. This 20 Year Insured Title Deed Guarantee is not available from any other estate agent, insurance broker or bank in Tenerife. 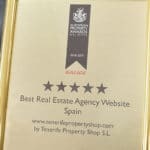 … Tenerife Property Shop has received over 20 INTERNATIONAL AWARDS for the quality of our service and are the only company worldwide to have received awards over 16 consecutive years. We created Tenerife Property Shop with the intention of offering a high level of service with complete security for our clients, and that has been our mission to this day. Over the years we have sold thousands of homes in Tenerife (and made many friends amongst the people we have helped). In that time, we have acquired a wealth of knowledge and experience and our service has become even more comprehensive and tailored to the needs of the foreign property owner and buyer. After all these years we still have a 100% record of our clients receiving clear and unencumbered freehold title deeds to the property they purchased. Today, we are pleased to help you at all stages, from planning your purchase to securing your ideal property and then assisting you for many years afterwards. In fact, we still help clients who purchased through us twenty years ago! 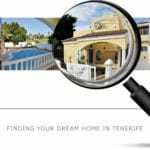 Tenerife Property Shop has grown to become the hub of the property market on the island and on this website, you will find the most exclusive portfolio of properties in Tenerife. Information is updated in real time, so you can rely on us promoting only properties that are really for sale and the prices and information will be current and correct. If you became clients of ours many years ago you will have experienced a continuity of service, with 3 of our staff working for us for more than 20 years, 2 for more than 15 years and 3 more working with us for more than 10 years. This is extraordinary in an estate agency business in a transient holiday area like Tenerife, but when we say we are a family business, we consider that all our staff are part of the family and they have great pride in the work that they do and the service they give. What is important to all of us is that we are passionate about our island. Tenerife has something for everyone, whether young or not so young. 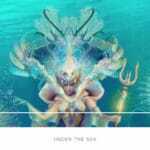 We hope that these pages convey something of the variety that Tenerife offers and as you explore the island further, you too will discover that there is so much more than just sunshine all year round and sparkling seas. We hope you enjoy our website and find it useful. We look forward to meeting you when you come to Tenerife and helping you to realise your dream of owning a home in the sun.